With Windows 10, Microsoft updated its OS to be more connected to the cloud than ever before in order to enable useful features. However, that also means that your private data is being uploaded to the company’s servers. There are ways to control what information your devices share, but now Microsoft is making that a whole lot easier with a new Web-based dashboard that brings all those settings together in one place. 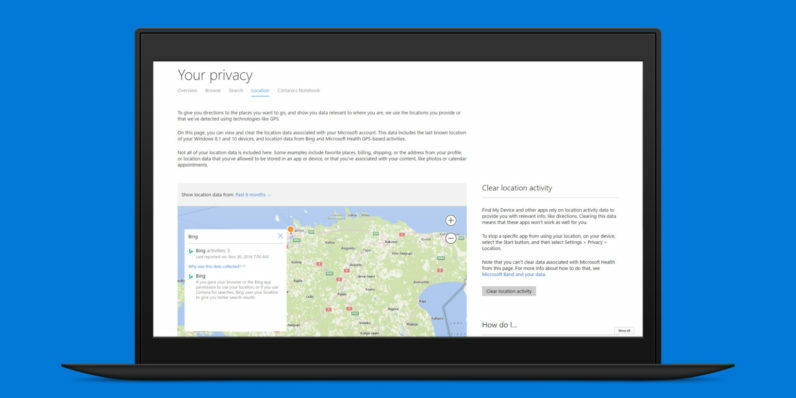 Head to account.microsoft.com/privacy and you can see your location, Bing search and browsing history, along with info stored in Cortana’s Notebook (that’s where the voice assistant keeps tabs on things like your interests, scheduled meetings, where you like to eat and so on). That’s handy for people who are diving deeper into the Windows ecosystem and are concerned about what the company’s platform knows about them. Microsoft says it’ll continue to add functionality to the dashboard and introduce more privacy controls from its apps there over time. In addition, the company is revamping its Windows 10 setup process to simplify its privacy settings for users installing the OS for the first time, and reducing the amount of data collected for system diagnostics to the bare minimum. This will arrive along with the Creators Update, which is slated to become available in April. Read next: Enter to win Samsung’s Galaxy S7 Edge smartphone... and a Galaxy Tab S2 tablet!